There are a lot of eggplant recipes out there, but one of the best thing about this one is that preparation is so easy and the ingredient list is quite frugal (and uncomplicated). As busy as we are today, thats a good thing. Another thing I like about this recipe is that the eggplant does not come out mushy; the texture is excellent. This recipe makes 8 servings. Slice the eggplant into 1/2 inch rounds. Many people peel it because the texture of the skin is chewy. I leave it on because I like it and because of the nutrients. Suit yourself. Pour about 1/3 of the panko in a shallow dish. Whisk the egg in another shallow dish. 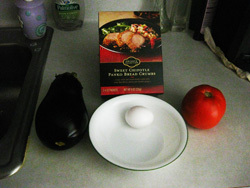 Just use the widest slice of eggplant to gauge how wide the dishes need to be. 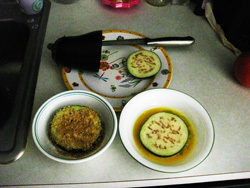 Dip the rounds in the egg and then press into the bread crumbs, on both sides, to coat. Add more dry panko to the dish as needed. Arrange the rounds on the baking sheet as you go. Slide the baking sheet into the oven and bake for 25 minutes. 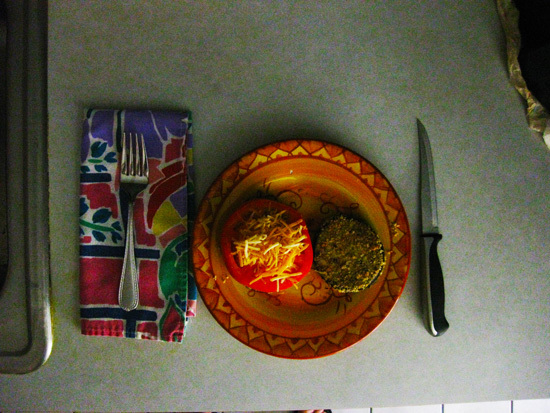 Slice the tomato, flip the rounds, and put one slice on each round. Bake for another 25 minutes. You can top the rounds with the cheese during the last 5 minutes or after they come out of the oven. When you balance the nutritional value of this fruit to its cost, it is a bargain. The skin contains nasunin. This is a strong antioxidant that assists in neutralizing free radicals. As well as being a prime anti-aging phytonutrient, nasunin also has antiangiogenic properties. These assist in fighting cancer by restricting the growth of new blood vessels. It also helps control high blood pressure by keeping blood vessels clear and relaxed. It also contains ingredients that affect ACE (angiotensin converting enzyme). As you might know, this is the same enzyme that is blocked by many blood pressure drugs including captopril, lisinopril and ramipril. The fruit is a good source of fiber so it aids in keeping your digestive system clean and clear. Vitamins? Its a good source of vitamin A (beta-carotene), B vitamins, folate, and vitamin C.
Eggplant is also loaded with minerals, primarily a large amount of potassium, magnesium, calcium, and phosphorous. And finally, no fat and only 27 calories per 1-cup serving.